It allows the patients to request an appointment in one of the time slots defined by the manager or doctor. The appointment slots are defined in advance. The manager can create the appointment slots using drag and drop - it will automatically generate the slots with the defined size (1 hour) in the selected range (shift). 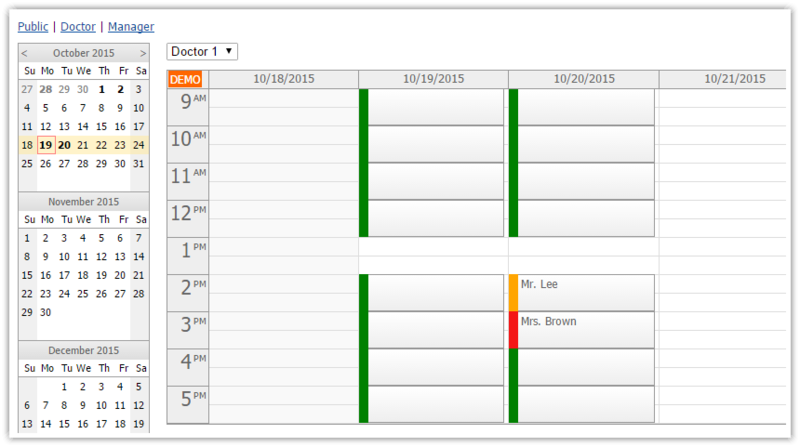 This view uses the AngularJS Scheduler control to show a timeline for multiple doctors. For an introduction on using the Scheduler with AngularJS see the the AngularJS Scheduler Tutorial. Creating multiple appointment slots at once using drag and drop (for one or more shifts). The timeline shows morning shift and afternoon shift (daytime only). This view uses the AngularJS Event Calendar control to manage appointments in a week view. For an introduction on using the Event Calendar in AngularJS see the AngularJS Event Calendar Tutorial. The calendar shows full 24 hours a day. Creating new slots using drag and drop. Moving appointment slots using drag and drop. Scheduling appointments in existing slots. Confirm appointments requested directly by patients using the public interface. Edit existing appointments using a modal dialog. It displays the slots defined in the doctor's or manager's view. Only the available slots are displayed. Slots in the past are hidden. Free slots are displayed with a green bar. No patient details are entered. Slots that were requested by a patient but were not confirmed by the doctor yet are displayed with an orange bar. Slots with a confirmed appointment are displayed with a red bar. The calendar onBeforeEventRender event handler to customize the events. The manager's view allows deleting the slots using the built-in event deleting feature. The server-side backend is notified using an AngularJS AJAX call ($http.post() method). The scheduler supports drag and drop time range selecting. 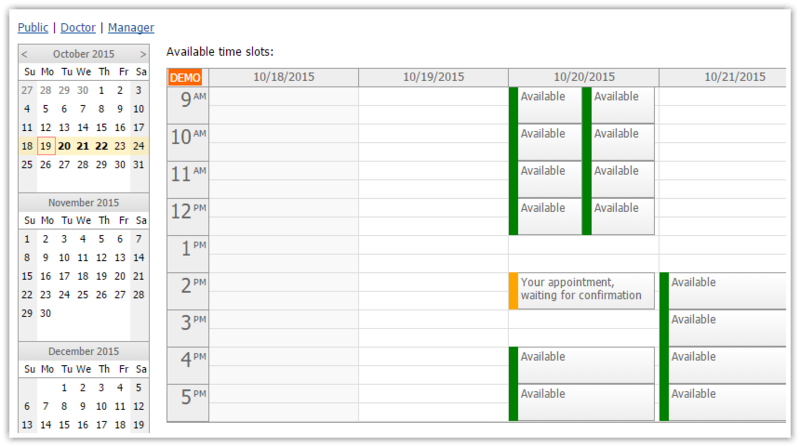 We will use this feature to add multiple appointment slots at once. The Hours/Shift radio buttons switch the scale (by generating an updated timeline), adjusts the time headers and scrolls to the original position. The time header rows show Months/Days/Hours for the "Hours" scale and Months/Days/Shifts for the "Shifts" scale. The patient's view allows the visitors to request an appointment in one of the free slots. After clicking a free slot the reservation dialog box is displayed. The appointment request dialog is displayed using a DayPilot.Modal helper - it displays a standalone page (appointment_request.php). The request is stored in the database and the slot status is changed to "waiting". For demonstration purposes the requested slot is linked to the user using the session id. In a standard application it would be replaced with an id of the logged user.